Wednesday night I made beetroot soup. When I was out in the garden I saw that the mice had been at my beetroot again (see this post from a previous year) So I decided to pull up what was still edible and make a soup for tea. 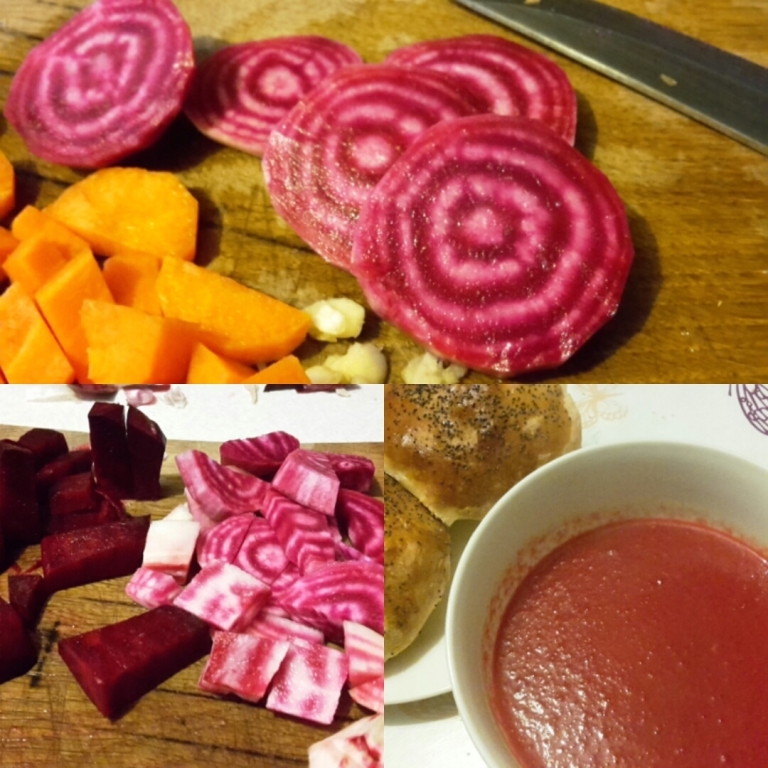 A simple soup consisting of about 6 beetroots, a couple of carrots, a red onion, loads of garlic, some stock and a cooking apple. The onion and garlic were sweated first to soften, then the other veg were added for a bit, the stock cube and water was poured on after about 15 minutes. I left this to simmer, prepared some dough to prove for rolls and went to bath the kids (the dough was mixed in the bread maker earlier though!)! I left it to simmer for an hour then blended it with a stick blender. I served it with rolls on the side and some crumbled feta in the soup. Those beets are so beautiful--Chioggia? Yeah, Chioggia, I just love the look of them, but they taste amazing as well. I'll be growing more of these next year that's for sure! That sounds pretty good. The only beets I've ever had were pickled and in a jar. But they were good. I love pickled beets as well, but roasted is my favorite! Although they do stain everything else! I clicked on your previous post and saw the mention of baiting mice traps with chocolate. Never heard of this! Sounds like a waste of perfectly good chocolate! But the mice love it! Easily the best bait for mice, although I always have a bit as well when I'm setting the trap! New Washing Machine Needed - Advice Please!